Who dares confront the parents of the Bay Area Waldorf School with the 23% vaccination rate? The Waldorf Way: No Tests, No Grades, No Shots? 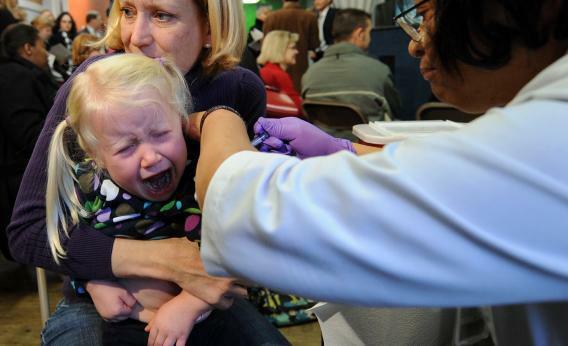 One reason not vaccinating is appealing: A girl cries during her H1N1 vaccination in Washington, D.C.
But—there’s always a but—I know those parents. Not the parents of this particular Waldorf school, which is well out of my personal jurisdiction. But Waldorf parents in general, and specifically multiple Waldorf examples of non-vaccinators. From a distance, I enjoy their Waldorfianity. We attend their annual holiday fair, where I appreciate the access my kids are suddenly given to things like metal punchers and copper for creating ornaments. I quietly snicker at such fathers of my acquaintance who are now, surprisingly, wearing bells around their ankles and performing what are described as traditional folk dances (which were certainly never a tradition in our family). Most of those fathers are laughing at themselves, too. They are not idiots. I would be hugely grieved if they were punished for their short-sightedness in the matter of vaccines by the loss of one of their children to a preventable disease. But of course (there’s that “but” again) they’re not likely to lose one of their own children. It’s more likely that one of their healthy kids, if infected, would pass, say, measles on to a child being treated for cancer, or with a blood disorder, or an infant. My friends’ children would probably be fine. The other infected child, whose parents might never even know what unlucky choice of seat on a bus or passing exposure led to her illness, might not. This is a common nightmare scenario argument, but with vaccination rates that low at some schools, it’s bound to become a reality. And as strongly as I feel about it, I have never, ever, once argued this directly to the face of a friend who I know didn’t vaccinate. Never once said, when one of my kids was too young or too newly adopted to have been vaccinated, that I want them to vaccinate their kids to protect mine, and others. Never once applied peer pressure to support what I believe is right. No, I’ve been too busy “respecting other parenting choices.” After all, I’m not going tie bells to my ankles, either, but it’s OK with me if you want to. Actually, I appreciate it. But your impact on herd immunity has implications far beyond Morris dancing. When did vaccination become something we can talk about only with people we agree with? “Respecting” others’ decisions can be read as endorsement or at the very least acquiescence, and for non-vaccination, I feel neither. By kindergarten, too, many of the “arguments” against vaccinating very young children have passed their expiration date. Those parents are due for a re-think. Even it if means some awkward conversations around the vegan, locally sourced stewpot, I’m feeling like it’s worth some discomfort to speak up.